Question: How do you see the future of American Jewish organizations? Answer: I suggest the article that describes how once Israel, its existence and essence, was the cause around which the American Jews united. This is what united them, gave them an incentive for the existence of their organizations, and was a source of inspiration. As they began to associate themselves more with the surrounding society and to ignore the existence of Israel, to that extent the cause that united them disappeared, and being disconnected, they “fell” in their ideology, activities, and influence. If they do not understand this and do not put Israel at the center of their activities, they will completely disappear as Jews in America. Israel, for its part, must actively play the role that unites all the American Jews and their organizations. The student receives all of the Light (the Light that Reforms and the Light of the filling) through the teacher. The order of the levels never changes and so the student’s role is to yearn to adhere to the teacher. We have such an example in The Book of Zohar about Rabbi Chiya who fasted for forty days in order to see Rabbi Shimon, his teacher, who had left them. When he didn’t manage to see him, he fasted for another forty days. This of course, doesn’t refer to a physical fast, but to spiritual actions. Rabbi Chiya ascended to the level of the upper Bina of Bina and he corrected himself to such an extent in the Light of Hassadim that he was awarded the level of connection with his teacher on a very high level. This means that he saw Rabbi Shimon sitting in the upper assembly, and it is thanks to Rabbi Chiya that he revealed the upper wisdom, the Light of Hochma, and the concealed mind, Mocha Stima’a. Question: How can we attain such a revelation? Answer: We should try to yearn for what the teacher says. Of course neither you nor I are on levels like Rabbi Shimon and Rabbi Chiya, but we will undoubtedly reach these levels in the future. In that case this should serve as an example for us, not in the physical psychological connection, but in the real inner connection. Everything that we learn and receive through the external mind and the inner filling comes from the teacher. Otherwise the teacher cannot do anything for us. He is in the position of a parent who can give his child only what the child asks for. If the child is full of energy and has the intelligence and desire, you can enroll him in different clubs, engage private tutors, and bring him books and educational games that can help him develop and advance to greater and higher levels. But if the child is autistic and behind in his mental development, the only thing a parent can do is worry about his physical existence, his physical needs, hoping that one day his mind will awaken. Everything depends on the deficiency of the student and this is a one way connection in that only the deficiency of the student opens up the teacher and obliges the teacher to open up and not to close himself. This is called the sorrow of raising children, when the teacher is forced to close himself according to the distance that the students keep from him. This happens with every student and I have been through this in a very dramatic manner myself. We have to study this state too, in order to understand that we are responsible for everything. The revelation of the teacher and then the revelation of the Creator occur according to the student’s vessels, and according to how he has prepared himself in the work with the friends. It is only through the connection with the friends that one can yearn for the teacher and through him, for the Creator. We have to find the common passion in this connection and then we find the right direction. Otherwise we don’t and the concealment doesn’t help us. The teacher teaches you where and how to open an opening through which you can enter the Creator. Imagine that you suddenly discover some concealment in the air somewhere, right here, and by the hints that the teacher gives you (he will never tell you directly and clearly, don’t expect that) you understand how to open a hole in the air and enter. Question: In what way is the wisdom of Kabbalah different from the rest of the sciences? Answer: The wisdom of Kabbalah is involved with discovery of the Creator, the discovery of the force of bestowal in those Kelim (vessels) that are in equivalence of form with Him, in other words, Kelim of bestowal. This never can happen in other sciences because they are involved with phenomena that are discovered in receptive Kelim. In Kelim of bestowal, I discover the higher power. These Kelim are detached from me because I must go out of myself and rise above my desire to receive. This makes it possible for me to comprehend this power objectively, investigate and study it. In the other sciences, we only discover phenomena that happen within us. This is even though it seems to us that they are happening outside of us in the surrounding world. However, through the wisdom of Kabbalah, we develop new senses, Kelim, in which we discover the higher power that is outside of us. So, the wisdom of Kabbalah is an objective wisdom about the Creator, about the higher power, about the only power that manages everything, including us, and this is the difference between the wisdom of Kabbalah and other sciences. The same scientific approach is practiced in the wisdom of Kabbalah as in all the rest of the sciences. As it is written, “A judge has only what his eyes see” (Talmud, Baba Batra 131a), in other words, a factual basis, but they are received in other Kelim, in Kelim of bestowal. Like every science, the wisdom of Kabbalah develops and discovers more and more. Only after the completion of correction and the discovery of the Light of the Mashiach (Messiah) will the wisdom of Kabbalah become an absolutely complete science. The Zohar, Chapter “Bo” (Come Unto Pharaoh): See how people must follow the path of the Creator and keep the commandments of the Torah so that through it, they will be rewarded with the next world, and be saved from all the accusers above and below. If the group has given man a five percent demand for bestowal, then the Light influences him accordingly. The other ninety five percent of his desire is not yet connected with the group and are directed towards reception. This part is also influenced by the Light that Reforms, but it does it in the form of “help against him,” a correction of the course, so man would see: his demands are directed the wrong way. “Help against him” comes in the form of “the accusers,” who as though resist the path, the goal, the group: everything that relates to spirituality. Essentially, they are us at the given moment, because our demand is not yet pure. In reality, a single Light comes from the above. It does not split like on the image, it simply influences my desires and properties in different ways; it varies the degree of the positive and the negative influence. Everything only comes in order to properly orient me on my path. When I include myself in the group, it reminds me that I should not fight “the accusers.” The purpose of these “enemies” is to be of help to me and give me strength. One should not fight the temptations of our world or the complaints about the spiritual path. Instead, one needs to ask the Creator for strength to rise above the “accusers,” instead of fighting them face to face. Similarly, it is impossible to fight the Pharaoh, one only can run away from him. I only manifest evil, and once it reaches its full strength, I will acquire the strength to run away. One needs to have a practical attitude towards the “accusers,” because they represent the forces that work on us. Their opposition is caused by my lack of proper contact with the Creator at this moment. This is the defect that I need to correct. It is difficult for man to wade through all his complaints for the Creator, remembering that He was the one who sent them. Here it is necessary to have a common opinion, a common foundation, a common aspiration, and group agreement. In the group we have a strong principle: Everything comes from the Creator, and one needs to turn to Him, instead of the “accusers.” Then we quickly and properly use them as intended. In the end, man is grateful for the “evil” as well as for the good, and he unites with the single source, which only sends good towards him. Question: Kabbalists says that on one hand everything is inside us, while on the other hand, we need to come out and connect. Does this mean that there are two Creators: and inner and an outer one? Answer: First of all, I recommend watching our program on the perception of reality where we speak specifically about this. There is nothing on the outside; everything is inside of man. At first I feel a lack on the inside; I lack the form of bestowal. This is a desire directed toward the Creator. And then I receive the form of bestowal, I become a giver, this means that the Creator has robed Himself in me; He has fulfilled me. Nothing exists on the outside. In the “Preface to The Book of Zohar,” Baal HaSulam explains that the world we perceive to be external is no more than a big illusion. After all, the creature is the desire to receive pleasure, which only feels what happens within it. Some parts of it become worlds, others, creatures. In the end it divides into many pieces, and I only associate myself with one of them while the rest of them appear to be external. Why is this so? This is because I went through a breaking. I was once complete, but then I became divided. And now, looking from my small point, I see everyone else as strangers. This is where I need to form the desire for unity. Once I unite with others according to the principle of love thy neighbor as thyself, I will return this entire big Kli inside of me, this entire reality, which I now see on the outside. Two drops merge into one in the same way, without even leaving a trace of their separation. So, the breaking was intentionally prepared for us so that we would be able to understand the form of nonexistence, which precedes existence, unity. It is not unity that matters, but the fact that I acquire the form of bestowal, the Creator, in it. I build the Creator in me. This is why in Hebrew He is called “Bore,” (Bo-Re, which means come and see), in other words, do and you will feel, understand, and attain. This is because you are doing it yourself. Nothing exterior exists. As I correct every detail of the breaking, I attain the Creator’s nature in me. To enter the spiritual world, a person needs to be equipped with desire, and spiritual desire is desire for oneness. Our unity is that very place where the spiritual world is located. There is you and me. If a person feels only himself, he experiences the corporeal world and lives in its environment. But we want to cover the gap and begin establishing connection between us. I strive for your desires (1) to receive them (2) and feel them as my own. For this reason, I turn to the Light as to something external although it, too, resides between us. The Light gives me strength to unite with you, and in this unification, I suddenly discover something new. When we become close and work together in Arvut (mutual responsibility, mutual guarantee), a deeper dimension becomes revealed to me as if in our oneness an aperture into the upper world opens . Baal HaSulam desribes this as follows: if we feel that between us there is a wall that doesn’t’ allow us to plug into each other, if we wish to break through this wall and are asking for it, then the Light descends and makes an opening in it. Unlike a door, it opens suddenly and only then you see that it had been initially “intended” there. As a result, you enter another’s desire and it becomes as your own. This entrance is the very exit to the higher rung: the Kli that you have attached to yourself turns out to be your newly gained world. In this way, you attach more and more new Kelim, or the souls, and by doing so, you expand your world. You keep ascending on the 125 rungs of the spiritual ladder, which means you unite with all the desires despite your egoism and hatred. Therefore, it turns out that you acquire the Light in the desire of another when you wish to perform bestowal to him. You fulfill another’s desire, and for you, it turns out to be the Upper Light. 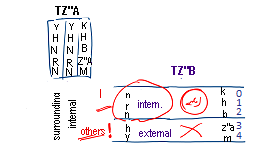 There is a big difference between the First Restriction (Tzimtzum Aleph) and the Second Restriction (Tzimtzum Bet). During the Tzimtzum Aleph, we receive part of the Light into Sefirot Keter, Hochma, Bina, Zeir Anpin, and Malchut inside ourselves, and this is regarded as the Inner Light or NRNHY (Nefesh, Ruach, Neshama, Haya, Yechida), but we don’t receive part of the Light in the same Sefirot, Keter, Hochma, Bina, Zeir Anpin, and Malchut; this latter is called the Surrounding Light. In line with these levels, all fulfillments can be divided into two parts: receiving and non-receiving. But I know what is located inside and what is outside since I have all these properties and have been studying them. I have established a connection with them, entered adhesion (Zivug de Haka’a). And even the part that didn’t enter inside me, I also know; after all, I was trying to merge with it and rejected it. I was given “two kilos of meat”, and I accepted only half a kilo, refusing the rest because I couldn’t receive more for the sake of bestowal. But I know what the remainder in 1.5 kg means and how it tastes. I remember how I was building an anti-egoistic screen for this fulfillment and how I pushed it away resisting receiving it. This is how we work in Tzimtzum Aleph. At the same time, in Tzimtzum Bet, while we receive the Light of Nefesh, Ruach, and Neshama, we don’t receive Chaya and Yechida and have no idea about what they are! I haven’t worked with the Lights Chaya and Yechida and don’t know what’s in them. This doesn’t exist “in me” for I simply pushed them away and didn’t have to decide what part I can and cannot receive. This means that in one case, I have a screen to receive one part of the Light and not the other. And in the second case, I don’t have a screen on this Light at all. When Malchut is in adhesion with Bina and can function as Bina, it is another Malchut, which is not just my desire. Connecting with Bina, Malchut receives special properties from it, the properties of bestowal that allow Malchut to taste and detect what is inside me and what is outside of me. If, however, Malchut isn’t connected with Bina and therefore rejects the properties of Chaya and Yechida, it cannot taste what is inside them; it doesn’t have any connection, any equivalence of form, with what is outside. That is why I see distant stars, the whole world around me, rocks, plants, animals, and even other people, but I don’t feel any of them as part of myself at all. Question: Is it possible to play the music of the spiritual (upper) worlds to music students so that they can try to draw its effect upon them? Answer: I believe that you can even play it to children. Question: Should these tunes be adapted for music schools? Answer: I think it is essential! We should offer this music to people of all ages and also to great symphony orchestras. We have already had such experiences. The tune Hine Kahomer (Like Matter) tells us that we are like matter in the hand of the “upper sculptor” who manages us, taking into account all our desires and impulses. He leads us to His goal according to our desire to follow it by ourselves and at the same time corrects us. By teaching a small child to walk we direct him and support him and at the same time force him to make some effort on his part and to overcome his fears. He stands and cries and doesn’t know what to do until he finally decides to make a clumsy move and falls. We pick him up and put him back on his feet and again force him to move. This is how the upper force manages us. If we want to start the spiritual ascent, we begin to feel how He supports us (just like we support a child) to the extent that we willingly make a move towards Him, and, at the same time, He pushes us a bit and leaves us alone so that by overcoming our fear we will make a step forward. But there is the feeling of great love in all that! Although we are a bit afraid and don’t understand, we learn that way, and in a parallel world actually perform the same actions but instead of physical efforts make mental efforts. This is what the tune Hine Kahomer addresses. On the other hand, this music is joyful. It is because I am glad to discover that I am like matter in the hand of the sculptor, like a wheel in the hand of a skipper. It feels good that I am not just an animal managed from Above that doesn’t know where it is headed. Two forces, a positive one and a negative one, manage us like reins from the right and the left by pulling us by what feels pleasant and repelling us by what is unpleasant. But I know what to yearn for by using them. When I put them one against the other, I perceive the positive force as negative and the negative force as positive and I can change myself. By using the tools that I was given, the heart and the mind, I can understand and perceive the upper Providence, and although I am like a steering wheel, like reins in the hands of the upper force, I can be in a certain relationship with Him, in a covenant, and thus knowingly move towards the desired goal. I still don’t understand that at the moment, just like a child who is put on his feet and doesn’t know what he needs to do. But we do understand that we have to listen to this force and to try to carry out His orders properly, and moreover, it is not physically but consciously, which means to constantly try to find meaning in His actions. Then we will grow spiritually. We talked a lot about unity. It is interesting to see when this process began in matter, so to speak, initially—is one. And second, how these trends, the trends towards unification, evolved. Since we introduced what happened long before the Big Bang, we will see what happened next. How did that primary program “express” itself in the matter that is known to us? What happens? It turns out that we, the entire universe with all the nebulae, black holes and other objects, was originally housed in the point that had no size? It is impossible to imagine that, but the fact pleases. Indeed, he argues that theoretically it is possible to unite everything without exception, even the capitalist and socialist, even egoism and altruism, and even an anti-Semite and Jew. Since this fact is scientific, we can assume that our hypothesis began to gain points. It is still interesting. Who and why did he decide to disturb the Commune-point idyll? Here’s how the famous physicist responds to this question. It is unfortunate that academic science is not able to answer such questions. Let’s refer to the non-academic science – Kabbalah. To be honest, this text raises more questions than gives answers. However, the poem is impressive. And not only because of the sublime poetics, for example, but also by the fact that the author aligns the concepts of space and time. By the way, it is almost four centuries before the discovery of the theory of relativity! In addition, the words “circle” and “round” catch the eye. It calls for the analogy with the word “sphere” in the description of the Big Bang, and with the shape of our planet and the globality of the world.